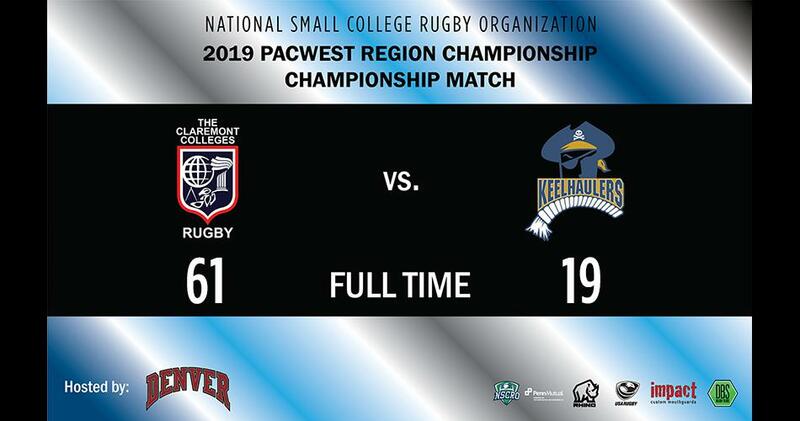 The Claremont Colleges has just won the 2019 NSCRO PacWest Region Championship. This is their fourth PacWest Championship title in a row. They defeated California State University Maritime Academy with a final score of 61-19. The 2019 PacWest Region Championship was held at the University of Denver in Denver, CO. They will join Endicott College (Region 1/Northeast), Christendom College (Region 2/Mid-Atlantic South), and St. John's University (Region 3/Central) at Siena College in Loudonville, NY on 26 & 28 April for the 2019 NSCRO Champions Cup National Championship. Earlier today, the New Mexico Highlands University faced Regis University for 3rd place. The Vatos took an early lead, 38-19 going into the half and was able to stave off the Rangers for the win, 65-50. Lawrence Garcia of NMHU was named MVP. Heart & Soul awards were also given. The Heart & Soul awards are given by the players to a teammate whom they nominate that best represents the "heart and soul" of their team. The winners include Justin Stallworth (NMHU), Donovan Ronan (Regis), Frankie Rayis (The Claremont Colleges), and Kevyn Huntsman (California State University Maritime Academy).